I have never been a superstitious person. I’m not afraid to have a black cat cross paths with me. I do use caution around ladders but that is more of a safety issue rather than a superstition. And I certainly don’t believe that I will have 7 years of bad luck if I have the misfortune of breaking a mirror into tiny shards of reflective glass. I will, however, have 7+ horrible minutes of clean up!! Bad luck seems to be brought on by bad attitudes. If I had woken up this morning in a state of panic because of the calendar date, I’m sure some incident would have befallen me and I would undoubtedly have had people tell me it is a result of the dreaded Friday the 13th. I arose this morning as I always do. I put on my jeans the same one leg at a time. There were no black crows eyeballing me from the top branch of their perch, screeching raptor-like obscenities and warning me to stay indoors. Did you know that historically there have been fewer car accidents on this day because people exercise so much more caution or don’t drive at all? The irrational fear that this day imposes is an interesting phenomenon. People have such an overwhelming fear of the 13th day of the month falling on a Friday but never really take the time to ask themselves why they have this fear. If you reflect on your childhood, somewhere along your journey, the superstition was unwittingly passed on to you. The moment that seed was planted, it matured into an irrational fear and has embedded its roots into your psyche. I’m a firm believer that we make our own luck. If you think bad things will happen on Friday the 13th then they probably will. Friday the 13th has never imposed any ugliness on me but I also impress nothing put positive thoughts on it. It is just another day. 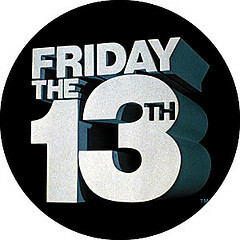 If Friday the 13th is your ‘monster in the closet’ – lock that closet door and throw away the key. It holds no more power than what you allow it to have. I tend to agree in regards to misfortune befalling those who have a negative aura around them. I’ve met plenty of folks who have such negative energies and failed to see that some of why they always had negative experiences was because of themselves. That’s not to say that bad things won’t happen even to the most positive of people but it doesn’t seem to happen as often to those folks. I do, however, think that there can indeed be bad luck or good luck. Sometimes things just fall into place that way but that’s more about coincidence than anything. I have to admit to being one of those people who “knocks on wood” after saying certain things because it does feel like I tend to curse myself lol. Again, I’m sure that’s coincidence but when there is a tendency for those things to happen, one tends to start to get a lil’ superstitious. As for Friday the 13th, for me it’s just any other day. I have heard a few people think of it as a good luck day for them. Interesting about the car accident statistic! I thought so too! But it makes sense for those who truly fear Friday the 13th and stay home.